Did You Know? Florida’s bats are the primary predators of night-flying insects, consuming millions of bugs each night. Even a small colony of just 100 bats can eat up to 200,000 insects in a single night (including many of your insect enemies like cabbage moth). That adds up to 73 million insect pests each year! 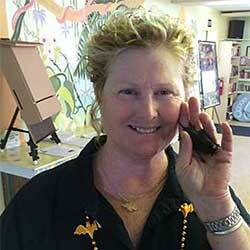 Shari Blissett-Clark with a rescued Florida bat. This month’s colorful program uses high resolution photography and research results to introduce America’s fascinating bats! From the largest to the smallest, these beneficial mammals play critical roles in ecosystem health as well as human health. Commonly believed folklore, myths, and misconceptions that have plagued bats for centuries will be revealed and replaced with bat facts that dispel unfounded fears, often fueled by grossly over-stated disease risk and ignorance. Species diversity, environmental and economic value, and bat conservation efforts will also be discussed. 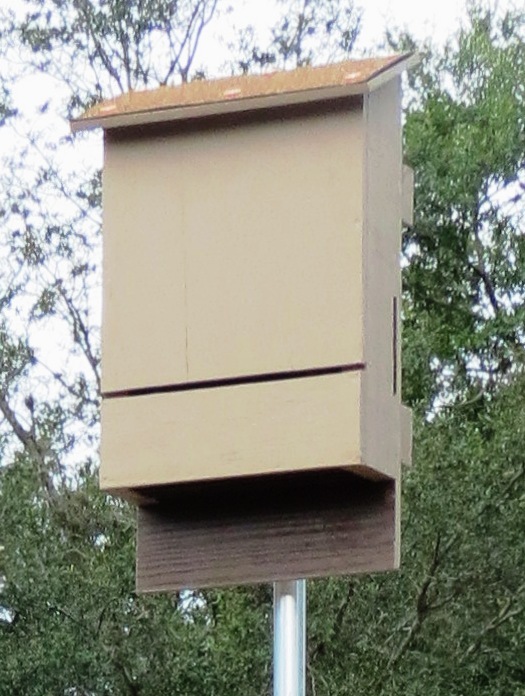 Live Florida bats will be displayed that are being rehabbed/have been rescued. Bat house brochure, Bat house common questions. This entry was posted in meetings and tagged bats. Bookmark the permalink.